The butterfly chair was developed in 1938 by an Argentinian architect named Jorge Ferrari-Hardoy. Throughout the 1950s and 1960s, the butterfly chair became an iconic symbol of modernism, with its minimalist design. 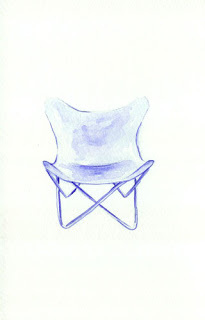 It's made with a simple metal frame with a single piece of fabric draped as a seat. This Ralph Lauren beauty uses a gorgeous leather. Though it's spectacular to look at and comfy to sit in, it offers little or no support and it's a bear to get out of if you're over the age of 12.